DOES ARUM PREFER ENTERTAINMENT OVER COMPETITIVENESS FOR PACQUIAO? "People will buy it to see Manny Pacquiao because he is knocking out, he is the aggressor, he is an entertaining fighter and I believe that most people that bought the fight tonight bought it not with the expectation that Shane Mosley was going to win, they bought the Margarito fight not because they thought Margarito was going to beat him, but they wanted to be entertained by Manny Pacquiao," stated Hall of Famer promoter Bob Arum shortly after Manny Pacquiao's lopsided unanimous decision victory over Shane Mosley earlier this month. Evidently, Arum is under the impression that fans are not concerned about whether or not Manny Pacquiao's opponents are competitive, but instead are simply tuning in because they expect to be entertained in one way, shape or form by the Filipino superstar. Contrary to Arum's belief, however, fans are no longer entertained by a lopsided blowout or the simple fact that it's a Manny Pacquiao fight. One need only look at the hundreds of fans who began walking out of the MGM Grand Garden Arena as early as the 10th round of Pacquiao vs. Mosley to understand that people want to see competitive matchups between athletes who are on the same level. Don't get me wrong, I'm not saying every fight has to feature the two best fighters of the division. Arturo Gatti and Mickey Ward proved without a shadow of a doubt that as long as fights are evenly matched, fans are guaranteed entertainment even if the fighters are on a lesser level than the elite. That being said, one has to wonder just how much longer fans will put up with Pacquiao being pitted against opponents who are coming off of less than spectacular performances or who are perceived to have a disadvantage going into the bout. Next up for Pacquiao is the long-awaited third bout with nemesis Juan Manuel Marquez. While many are eager to see another fight with the man who has given Pacquiao his toughest challenge to date, you can't help but wonder just how competitve of a fight it will really be considering that the last time they fought was over three years ago as super featherweights, three weight classes below Pacquiao's current division where he reigns as the WBO welterweight champion. Since that bout, Marquez has ruled as the lightweight champion, just one division north of their second classic encounter. His lone attempt to move further up in weight was a disaster when he was soundly beaten every round by Floyd Mayweather in a welterweight bout. When Marquez takes on Pacquiao later this year, although the bout is at a catchweight of 144 pounds, he'll still be at the same disadvantage that he was when he faced Mayweather. That being said, can we truly expect Marquez to be competitive against Pacquiao, who many consider to be even more dangerous than Mayweather? 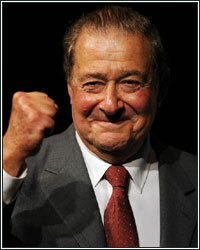 Come November, we'll find out if Arum was correct in his assessment. Will fans tune in to be entertained by Pacquiao even if they already know it won't be competitive? We shall see.